This project makes a lovely addition to your holiday decorations, and is a good project to practice your fabric draping skills. 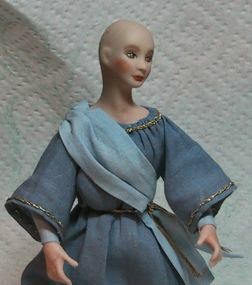 The doll head used is Mary Catherine, legs are Ayanna Mold 103, and arms are by Paulette Stinson, Mold #A-1. All of these molds can be purchased from House of Caron. 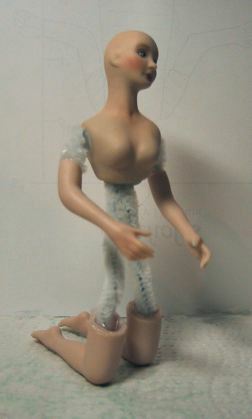 Assemble doll using the above mentioned parts. Use chenille stems and hot glue to form wire armature. 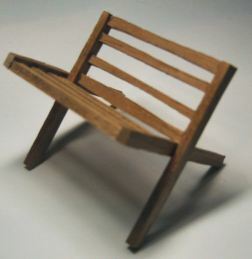 If you need more information on assembling a miniature doll, please refer to my tutorial, Assembling a Miniature Doll.. Bent legs are used, to provide kneeling position. 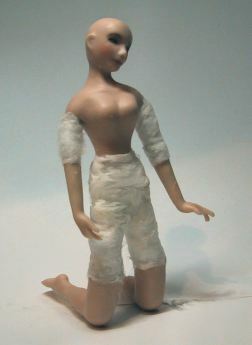 Body wrapped with cotton and ready to costume. No, your eyes are not tricking you, this is a different head and parts. Forgot to take a picture of the doll we are making at this point, so had to make up another sample!!! This is a VERY basic gown. Use the link above to print out the pattern, then cut out of fabric on folds as indicated. I used cotton batiste, and dyed a medium shade of blue. I then diulted my dye mixture by 1/2 and dyed additional fabric for headpiece and drape. By using different strengths of the same dye color, your colors are always sure to blend nicely.Fold gown right sides together at shoulders, and glue side/underarm edges. Turn to right side, and glue under narrow hem along bottom edge, and at edges of sleeves. 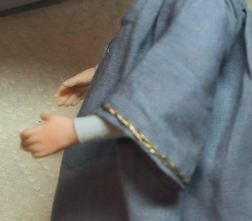 I used gold metallic thread to sew a chain stitch edging along the sleeves. Then sew two rows of gathering stitches around neckline edge as indicated on pattern piece. Leave ends of threads 2" in length to use in gathering neckline. Turn under neckline edge along top row of gathering stitches and finger press. 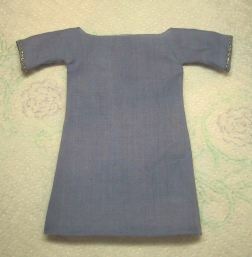 Place garment on doll, with top edge of neckline folded under. Pull up both rows of gathering stitches, drawing up the garment around neckline to desired size and shape. Distribute fullness evenly. Tie off gathering threads. Run a small bead of tacky glue under edge of fabric, and press into place. I applied a length of gold thread over the second row of gathering stitches for an accent, and to cover gathering stitches. Using contrasting fabric, glue a tight tube of fabric around arm from wrist to just above elbow. Cut a piece of contrast fabric 1 1/2" wide by 8" wide. Glue under narrow hems on all edges. 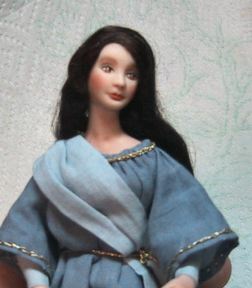 Find center of the fabric, and place on dolls shoulder, pinching in folds in fabric and pin. Bring fabric across chest and to waist at opposite side. Again, adjust folds, and pin into place. Mist this piece of fabric with hairspray. Use a piece of cording, or braided gold thread and tie around waist, adjusting fullness in gown evenly around waist. Apply long flowing hair to your doll. Cut a rectangle of contrast fabric 3" x 6" in length. Fray check all edges. Along one long edge, turn under 1/2". This will be your front edge. 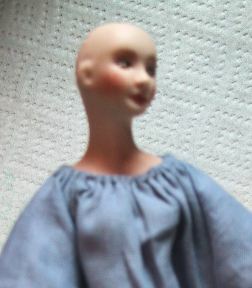 Place over dolls head, placing center of folded edge at top front of head. and saturate with hair spray. Grasp with your hand, and shape into folds around dolls head. Be brave, crush and scrunch, until the fabric falls in realistic folds. Saturate the lower portion of the gown with hair spray. 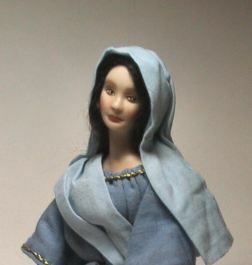 Arrange folds around the dolls knees with fabric flowing naturally onto the ground. You can pin the fabric into place to hold till spray dries, although I found that by spraying, scrunching and respraying until I had the desired effect, that no pinning was necessary. Allow fabric to dry completely. Larrell built me a simple manger using 1/4" square wood pieces. The form is basically two X's on the ends, with slats in between to form the sides of the manger. I filled the manger with straw from the florist department of our craft store, adding a layer at a time and attaching with spray adhesive between layers. 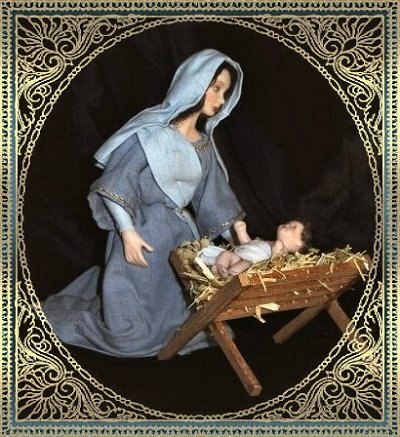 Baby Jesus is represented by Baby J, from a Doreen Sinnett mold. I hope you have enjoyed this project. May you and yours have a blessed Christmas and best wishes for a happy and healthy New Year.